Belmont University’s Up ’til Dawn team recently won the organization’s Program of the Year Award. The annual event, which raised more than $140K last year, supports St. Jude Children’s Research Hospital with funds as students across the country stay awake all night on college campuses to raise money for childhood cancer research. The Program of the Year Award recognized the St. Jude Up ’til Dawn school that implemented the most outstanding overall program, exceeding expectations in all aspects of the event. This includes how the Executive Leadership Team worked together, awareness and public relations efforts, recruitment, fundraising efforts, side events and the main Up ’til Dawn event. 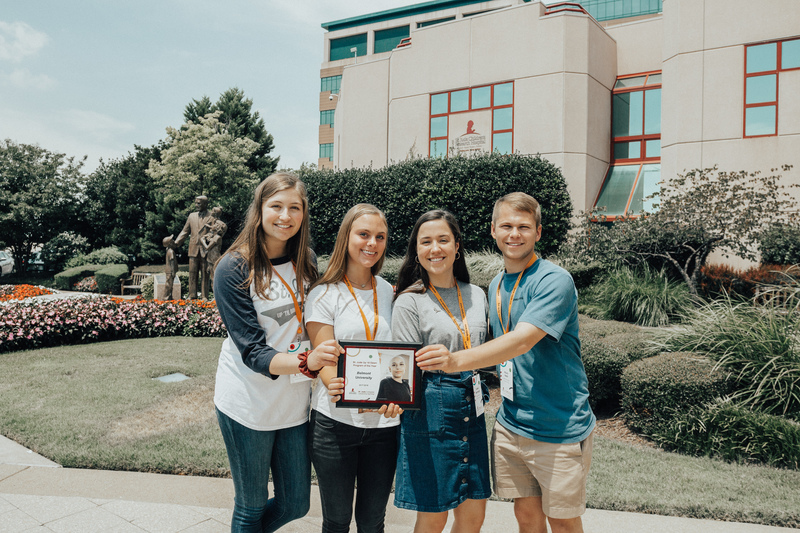 The team received their award at the Collegiate Leadership Seminar in Memphis, held each year to support the students who lead Up ’til Dawn on their campuses. By the time their Up ’til Dawn event day rolled around, the Executive Board had recruited 872 participants and raised $148,000 — a new school record. Their impressive fundraising total was revealed live on national television when Fox & Friends featured the story and allowed the group to share their efforts with the country, a first in St. Jude Up ’til Dawn program history. Belmont alumnus and Executive Director of last year’s Up ’til Dawn Executive Board Joe LaMartina was proud to hear of the group’s honor. “The award is a culmination of the amazing hard work from the Up ’til Dawn team this year and the passion of the Belmont community for St. Jude,” he said.